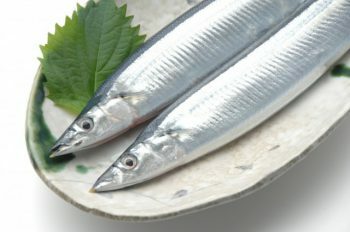 The Pacific Saury, which is called sanma in Japanese, is one of the ingredients that represent the taste of autumn in Japan. From September to October, while the best season, it is the blissful moment to eat salted and grilled Sanma with grated daikon radish and a little drop of soy sauce. “秋刀魚”, which means the autumn sword fish. If you look at its shape and brilliant body, it will be easy to understand the origin of Sanma is a Japanese sword. It is very beautiful fish. When this Kanji character applied to Sanma, it is considered to be the Taisho era, just a hundred year ago. That’s not much long ago. According to my investigation in library, the period that everyone started to eat Sanma just like today, is said to be the Edo era, that’s also not long ago. In the early Edo period (1600’s), sanma fishery was mainly held for the purpose of capturing fat however, the fishermen perceived “it’s delicious even if you eat as it is!” Since then, it spread even among from the fishermen to the common people. At that time, the samurai and the upper class people did not eat the greasy food because they thought it was vulgar and low. But the food culture of the common people gradually expanded to the upper classes as well. “Meguro No Sanma“, is a rakugo story of sanma in Edo period. A feudal load went on a short trip with his servants to Meguro, a famous sightseeing spot in this period, and had eaten a grilled sanma for the first time there. After the trip, he thought about the taste and smell of the grilled sanma every day because he loved it so much. Then, his servants tried to serve the grilled sanma in the castle. It is easy to buy a fresh sanma of the fish market but no one knows how to cook. Removing the fat, pulling all the fish bones and putting it into a bowl, a strange sanma was served. However, the size of sanma is quite small and landing season delayed, moreover the landing amount seems to be small in autumn 2017. This trend has continued for these few years. The rising seawater temperature would be the primary cause of this problem. By this, the flow of the Oyashio (Kurile) and Kuroshio (Japan) current has changed, then the fishing ground is rapidly moving away from Japanese coastal waters, poor weather (frequent typhoons, etc. ), plus overfishing of fry sanma by foreign fishing vessels, would be the reasons. Perhaps, more people, who have not ever seemed to eat sanma, became tend to eat it. Everyone notices something delicious one of these days. And Japanese food culture now spread around the world. 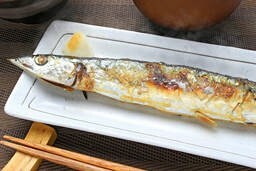 When you come to Japan, please have a try and enjoy grilled sanma, the taste of autumn!